Valkyria Chronicles is a strategy RPG developed and published by Sega that was released in late 2008. Although the game had little hype going into release, it was almost instantly bombarded with very positive user and critic reviews. It is considered to be one of the best strategy games of all time, and has been loved by many for its unique mixture of gameplay elements. With that said, is Valkyria Chronicles just another difficult strategy game, or is it a game that stands among the best in the industry? 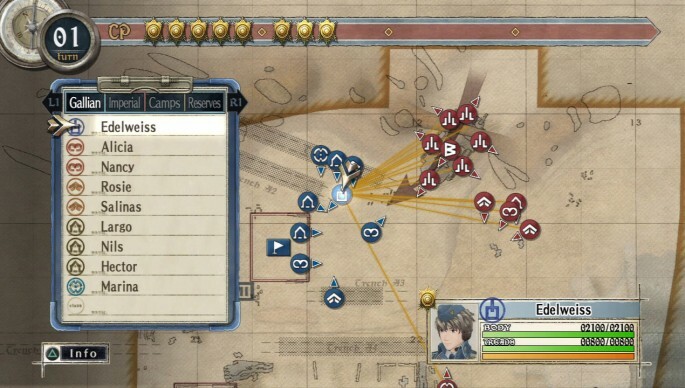 Valkyria Chronicles is a strategy RPG like never seen before. Traditionally, strategy RPG’s have used geometrical grids in a 2D turn-based environment. Valkyria Chronicles is also turn-based, but functions in a 3D world using combat most similar to a third-person shooter. There are a range of different classes all with their own strengths and weaknesses including Lancers, Scouts, Stormtroopers, Snipers, Engineers and even Tanks. Each unit accommodates each-other and the abilities involved create tactics that mimic the high-quality strategy of games like chess. Thankfully, unlike other SRPG’s, Valkyria Chronicles gives out a ranking at the end of every battle that rewards you for how well you did. This translates into not only experience points but currency as well. The experience points are then used to level up the different classes whichever way you would like, and since classes are leveled rather than individual units, the system prevents you from feeling like whatever characters you started with you are stuck with. On the other hand, the currency is used for research & development which means new weapons, armor and outfitting for your tanks. The game progresses through a series of chapters within a book, and each chapter includes at least 1 battle as well as several cutscenes. The story itself is simple but the variety of characters and relationships help create a very intriguing tale with some intense moments and also a great finale. In summary, the story is very lighthearted and the character development is great. One great thing is that Valkyria Chronicles is very easy to pick-up and play and the introduction really helps ease even the newest newcomer into the gameplay mechanics and strategies involved. It is easy to say that this is one of the easier strategy games to get into, and while there is a lot of depth, the game is enjoyable and entertaining for just about everyone. Valkyria Chronicles is based on a 3D strategic plane, and the controls really accommodate the gameplay. Once a unit is selected from the tactical map, the camera is brought down to the player’s level and you are free to move about. Movement distance is restricted on each turn based on the class of the character, and the movement is very tight and responsive. Once your character is in position for an attack, the press of R1 pauses the map and allows you to line up a shot. At this point the game turns into somewhat of a third-person shooter, which gives the game some interesting action elements and some versatile gameplay. The menu also doesn’t suffer from lag whatsoever and really helps make the experience smooth and intuitive.